Sherlock Holmes is an unparalleled genius who uses the gift of deduction and reason to solve the most vexing of crimes. Warlock Holmes, however, is an idiot. A good man, perhaps; a font of arcane power, certainly. But he’s brilliantly dim. Frankly, he couldn’t deduce his way out of a paper bag. The only thing he has really got going for him are the might of a thousand demons and his stalwart flatmate. Thankfully, Dr. Watson is always there to aid him through the treacherous shoals of Victorian propriety… and save him from a gruesome death every now and again. An imaginative, irreverent and addictive reimagining of the world’s favourite detective, Warlock Holmes retains the charm, tone and feel of the original stories by Sir Arthur Conan Doyle while finally giving the flat at 221b Baker Street what it’s been missing for all these years: an alchemy table. Reimagining six stories, this riotous mash-up is a glorious new take on the ever-popular Sherlock Holmes myth, featuring the vampire Inspector Vladislav Lestrade, the ogre Inspector Torg Grogsson, and Dr. Watson, the true detective at 221b. And Sherlock. A warlock. I love Sherlock Holmes! I love the Robert Downey, Jr. movies, the BBC show, Elementary. All of it. But, I have a confession. I’ve never even read the original books! I know! I need to read them. I want to read them. But instead I read Warlock Holmes! Forget the Sherlock Holmes you know and love and make room on your bookshelf for Warlock Holmes. Where Sherlock is brilliant and able to deduce the most minuscule details from seemingly nothing, Warlock Holmes fails miserably. He does, however have the power of demons behind him. His new roommate John Watson has to help him time and time again from letting his powers be revealed to the general public. Delightfully witty, this book is great for any Sherlock fan. Quirky, funny, and clever are all excellent words to describe this quick read. 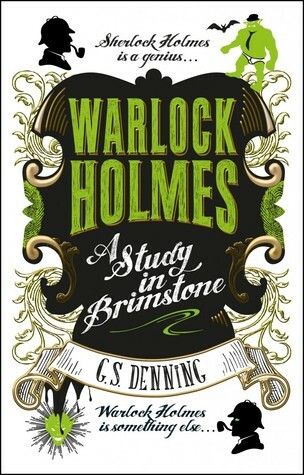 The book is divided into several cases that Warlock and Watson must solve, to assist the real Scotland Yard detectives, Lestrade (a vampire) and Grogsson (an ogre.) If they can’t solve the cases, they risk being incriminated themselves, because of their oddities. I would definitely keep reading this series if they release more books. PS: What do you think of this take on Sherlock Holmes? Previous Funko Fridays Funko Pop Swap! !